Demand for industrial controls in China is projected to rise 13.6 percent annually through 2015 to 259 billion yuan. Advanced control products will continue to rise faster than conventional controls. Electrical and electronic equipment will be the fastest growing market, supported in part by the increasing penetration of industrial controls in this segment. 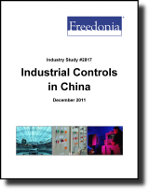 This study analyzes the 137 billion yuan industrial controls industry in China. It presents historical demand data for the years 2000, 2005 and 2010, and forecasts for 2015 and 2020 by product (e.g., adjustable speed drives, computer numerical controls, programmable logic controllers, proximity and positioning sensors, AC and DC starters and contactors, special purpose controls) and market (e.g., durable goods manufacturing, nondurable goods manufacturing, nonmanufacturing). The study also considers market environment factors, details industry structure, evaluates company market share and profiles 38 industry participants, including People Electric Appliances Group, Schneider Electric, and DELIXI Group.